People often advise you that you should follow your passion and dreams and the money will follow. Sure there may be some truth to that but it depends on what your passion is and how motivated you are. If you have a passion for hitting dive bars and eating chicken wings and you figure out a way to make money doing it please advise me. Take myself for example. My passion is outdoor sports, particularly fly fishing and skiing. However, I have steered clear of working in those industries because I don't want it to ruin something I love to do. Sure I could become a fly fishing guide and spend my days guiding other people, or I could just do it for fun. I chose a profession that allows me to pursue my passion. Don't think that following your passion means working in that space, maybe you want to focus on what will allow you to pursue your passion. Realistically this step is what success is all about, that and execution (see final paragraph). I don't think that people struggle to come up with good ideas they struggle to follow through on them. People get all excited about an idea and then they start to think about all the work that is needed to get to the end result of making money. So what happens? They quit before they even get started. They don't plan and go through the proper analysis. If you run a proper analysis on your idea you will know if it is a good idea or not. Looking at items such as a competitor and risk analysis, financial forecasts, and a feasibility analysis will tell you if your idea has legs or not. Is it a lot of work to do a proper analysis on a business idea? You bet it is but it needs to be done. The reality is most people aren't willing to put in the work that is required to get a good business idea off the ground. It's not a lack of ideas, it is a lack of motivation and hard work to get those ideas off the ground that keeps people from actually following through on their business ideas. I have seen some people with great ideas never get anywhere because they are too stubborn to get any help. People want money to back their ideas but they don't want to give up anything. You need to understand how to properly raise money for your business and how to build a team to help you execute your idea. Those business owners that want to do everything themselves will be great at operating their business, but terrible at running their business. Is there a difference? Absolutely, and if you don't know the difference then I'm not sure you are the person that should be trying to develop your idea into a business. Great leaders understand they can't do everything. Leaders know that in order to scale a small business you need to surround yourself with great people. There are two types of higher level people in small businesses; the idea guy and the leader (aka CEO). Some recognize they have great ideas but they don't know how to lead so they hire a CEO. It is the CEO's job to execute on the vision and grow the idea into a business. Back to my second point I said most people fail in the hard work phase (planning phase) but a majority of people just fail to execute. You might have an awesome idea, with a great business plan, strong forecasts, investors lined up and a killer team. 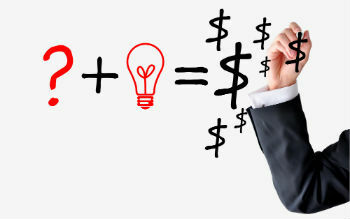 However, if you don't know how to execute then you will never turn your great idea into a profitable business. Execution is the difference between success and failure. Some idea people realize they don't know a thing about executing on their ideas, so they hire great leaders. If you don't know how to properly execute on your idea then you need to admit that and find someone that can help you execute on your idea. Great ideas don't start with making money, they end that way. There is a lot of hard work that needs to happen between the idea generation phase and the profitability phase. The next time you think of a great idea realize that it is possible to make money on it but you just need to plan, work hard and execute.